"The CAPACOA experience gave FIXT POINT an unparalleled opportunity to pitch our project The Tale of a Town to presenters from across the country, leading to numerous confirmed partnerships. To be showcased in front of such a widely respected audience through this high calibre platform allowed us to highlight our project in the best light possible!" As in 2016, CAPACOA will partner with CINARS during their Biennale and with MUNDIAL MONTRÉAL for the 2018 CAPACOA Conference. Delegates will experience bigger than ever international networking opportunities, with more than 1500 performing arts professionals from 40 countries, 150 performances, and thought-provoking professional development. 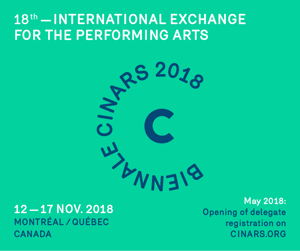 CAPACOA @ CINARS, will be a two-day professional development program hosted by CAPACOA and embedded in the CINARS Biennale, it will place November 12 and 13, 2018, in Montreal, Quebec. In addition, CAPACOA will also collaborate with MUNDIAL MONTRÉAL, North America’s World Music Summit, CAPACOA members will have the opportunity to see the hottest emerging talent in world music! CAPACOA will not hold a full showcase program, delegates will be encouraged with their registration to attend the various CINARS and MUNDIAL MONTRÉAL showcases.